One of my favorite moments to capture at weddings is the first time the bride and groom see each other on the wedding day at the First Look. It's such an emotional and sweet moment as the excitement of the occasion sets in. 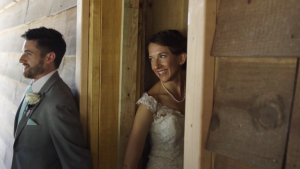 A newer trend in the past few years is doing a private first look before the ceremony, instead of that moment being when the bride walks down the aisle. As I write this, I'm in the middle of planning my own wedding with my fiancé, and we've discussed this quite a bit. There are two kinds of "first looks" that you might want to consider. The first being the full reveal, where the bride walks up to the groom and then he turns around to see her one-on-one. For those who enjoy the tradition of the first moment being when the bride walks down the aisle, a great alternative is where you stand around opposite corners of a wall or tree and hold hands without actually seeing each other. This is the one we are doing for my wedding! This is great because you get the tradition, plus you get to talk, share sweet words, and pray together. Your wedding day is going to bring out "all the feels" and you're going to experience the highest level of anticipation, excitement, joy, tiredness, and nervousness all in quick succession. Before you get up in front of all your guests, it's a great moment to experience a sweet moment with your beloved, who is going through the exact set of emotions! You'll be the center of attention throughout the day and once the ceremony is over, you'll have tons of family and friends seeking to visit and party with you for the next several hours. A first look gives you a short window of time to enjoy with your beloved without pressure - dance, laugh, and cry together! 4. A First Look Gives You More time for celebration! Depending on how your wedding day timeline is setup, doing a first look also allows you to knock out a TON of photos before the ceremony, including wedding party and your portrait time. That only leaves family photos after the ceremony, which shouldn't take too long. With a first look, you can easily add at least an hour or more to your celebration time! Want to see the first look from the images above? Here's Savannah + Chris' wedding!